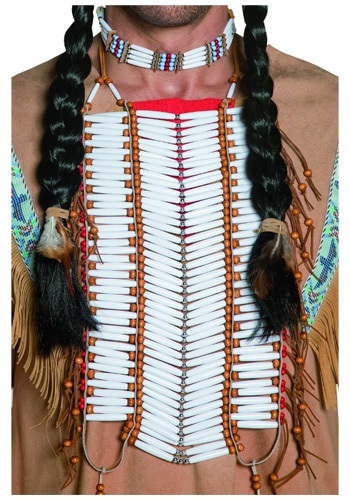 Native American beadwork is simply incredible. Even today, after hundreds of years, the clothing they produced from putting beads together remains inspiring and elegant, which is why you so often see them imitated in other works. You might be tempted to make your own bead design instead, but just trust us when we say that's not a good idea. Sure, you can have the pride of having handmade something but it will most likely look pretty shabby, not nearly as elegant as you hoped. Then you're left with a handful of beads you're not sure what to do with. Give them to a cat? What's a cat going to do with a bunch of beads? Probably chase them around, if we know cats. Ah well, at least you tried. Pair this Native American-inspired breastplate accessory with many different looks. It has different color beads, mostly white, and a couple feathers that hang down around it as well. Easily ties around the neck.